Did you know there are over 365 acupuncture points spanning from our heads to our toes? During my training we had to memorise anatomical directions like a taxi driver learns the knowledge. Points lie on channels or routes following anatomical pathways through muscle seams, curves in bones and dips between structures. You need to know the route and the anatomical landmarks to locate the point, which is smaller than a grain of rice. Inevitably in practice some of these points get used more than others. 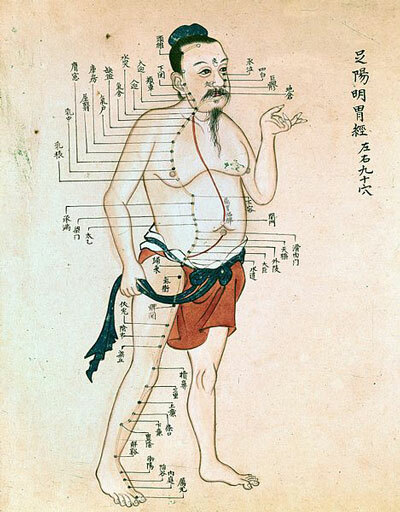 Most commonly when going to visit an acupuncturist the points chosen will lie between elbow-hand and knee-foot. Which can be quite surprising when you present with a headache and your practitioner starts with points the furthest they can be from where the aliment is. I would like to talk about one of the more commonly used points, which doesn’t point to its commonality but just how powerful and effective it can be, Tai Chong or translated into English Great Rushing. To understand this point first we have to understand a little about qi. Qi, pronounced chi, is the energy or life-force which flows through our bodies making all the functions it has to carry out possible. When everything is working well qi flows freely. When it becomes stuck, depleted or in excess it can result in pain and disease. Lots of factors affect qi, namely life…it happens. Stress, emotions, trauma and diet are to name a few of the factors which affects it. So the main job or function of Tai Chong is to smooth qi when it stops moving the way it should. I invite you to find this point (unless you are pregnant, this is one of the points which induces labour). Pinch the fleshy space between your big toe and the one next to it. Is it tender? Work it for a while, do you feel more relaxed? A little less stressed? It works like a pressure gauge on a boiler, reset it to make sure the water pressure is right and the water will flow and warm all the rooms in the house to the right temperature. 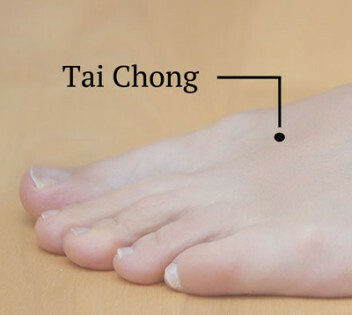 Reset Tai Chong and it moves qi to flow smoothly through the body the way it should. Tai Chong affects body and emotions. If qi is not moving smoothly it can affect the body resulting for example in pain, stiff muscles and poor circulation. It can also affect our emotions. We can become stuck emotionally, unable to move forward or angry for instance. In conclusion Tai Chong or Great Surge helps both our physical and emotional well-being, which is probably why it is used so often. The qi reset button.